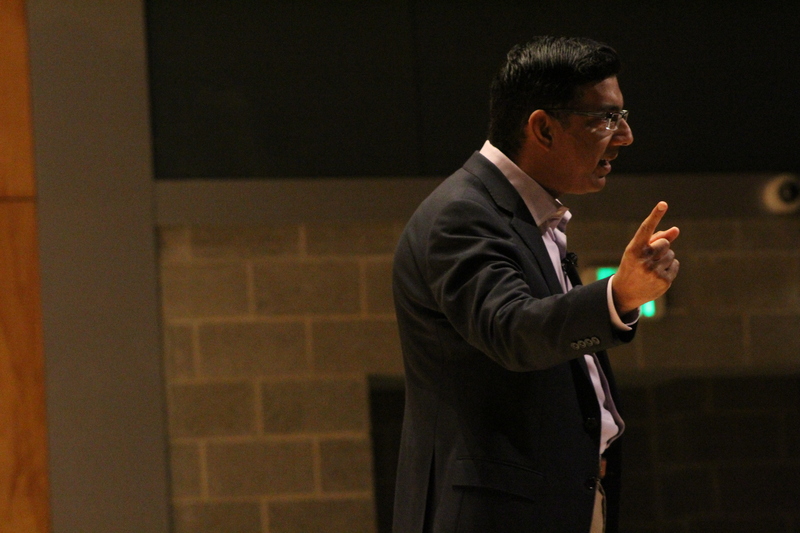 Near the end of his Wednesday night lecture in the Sydney Gelber Auditorium in the Student Activities Center, conservative speaker and documentary filmmaker Dinesh D’Souza made a joke about the Holocaust while criticizing the media’s coverage of the Charlottesville white supremacist rally. D’Souza’s lecture, titled “Exposing the Radical Left,” part of his “Dinesh D’Souza Unchained” series, took place the day before National Holocaust Remembrance Day in the United States. The joke drew laughter from most of the crowd. The Stony Brook College Republicans brought D’Souza to campus, hoping the speaker would open up what they feel is a limited culture of debate at Stony Brook University. Born and raised in Mumbai, D’Souza came to the United States in 1978 to further his education. After graduating from Dartmouth College, he gained notoriety as an author and conservative political commentator. D’Souza has become famous for making political documentaries, like 2016’s “Hillary’s America: The Secret History of the Democratic Party,” and for comments his critics perceive as inflammatory, like a recent series of tweets directed at survivors of the Feb. 14 shooting at Marjory Stoneman Douglas High School in Parkland, Florida. Some audience members excited for the lecture felt D’Souza was a welcome change of tone at a school that hosts mostly liberal speakers. D’Souza’s lecture mainly focused on debunking criticism that Donald Trump and the Republican Party are racists and fascists. The speaker said the public’s ignorance about fascism has allowed the term to become a political taboo, levied against Trump and conservatives without substantiation. D’Souza urged the audience to compare the Nazi Party platform with the goals of the modern day Democratic Party and switch out the word ‘Jew’ with ‘the top one percent’ as a thought experiment. D’Souza defined fascism with a quote about totalitarianism from a 1925 Benito Mussolini speech, although he incorrectly attributed it to Italian fascist philosopher Giovanni Gentile. Using this definition of fascism, D’Souza criticized former president Barack Obama’s response to the so-called Great Recession of 2007-2009. D’Souza also addressed his felony conviction for an illegal $20,000 donation to Wendy Long’s unsuccessful 2012 campaign to challenge incumbent New York Sen. Kirsten Gillibrand after a member of Stony Brook’s Young Democratic Socialists of America (YDSA) chapter yelled “you’re a convicted felon” during the lecture. The College Republicans decided to cut off a lengthy Q&A session that followed the lecture after going over their allotted time. A YDSA member who had been waiting in line objected loudly to the cancellation before being yelled down by audience members. In his reaction to the event, YDSA founder and senior psychology and philosophy double major Thomas Sheroff criticized D’Souza’s controversial history and political stances. While he emphasized he can only speak for himself, College Republicans member and senior history and political science double major, William Brennan, had no objection to letting the YDSA member ask his question.